"The Cord of Life" is a short crime drama. The film is included in our program to illustrate the work of our star Billy Bitzer, who shares the cinematography credit with Arthur Marvin. 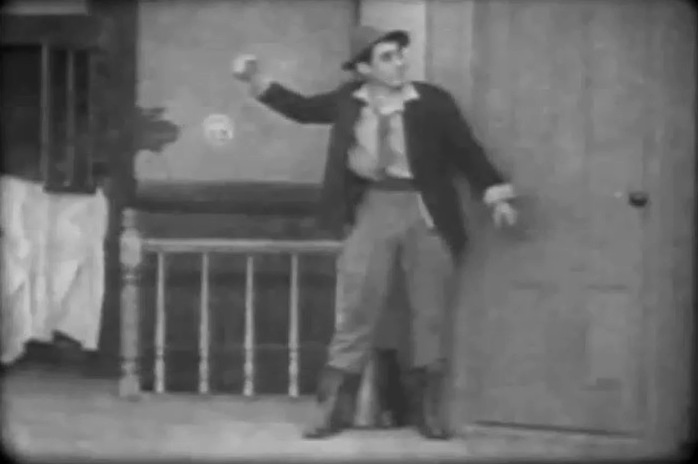 Our stars Arthur V. Johnson and Florence Lawrence have small parts in the film. George Gebhardt demands money from Charles Inslee, but is thrown out empty-handed and vows revenge. Then when Charles Inslee's wife Marion Leonard leaves their little girl alone for a moment George Gebhardt jumps in. He puts the child in a basket and lets it hang outside on a cord in such a way that when the window gets open, the child is bound to fall several floors to its death. We trust that silent film lovers will not judge harshly the quality of the print. Many early D.W. Griffith films are only available in a paper print format, and we are all very lucky that they have survived the trials of time for us to enjoy. George Gebhardt talks to Florence Lawrence in "The Cord of Life" (1909), directed by D. W. Griffith. 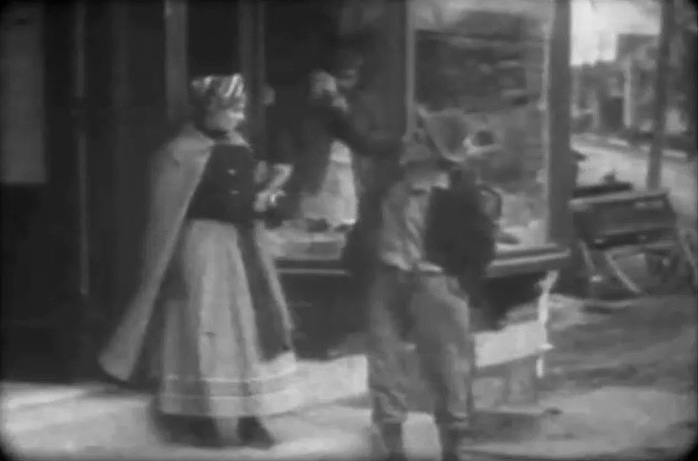 George Gebhardt apparently asks Florence Lawrence for directions in "The Cord of Life" (1909), directed by D. W. Griffith. 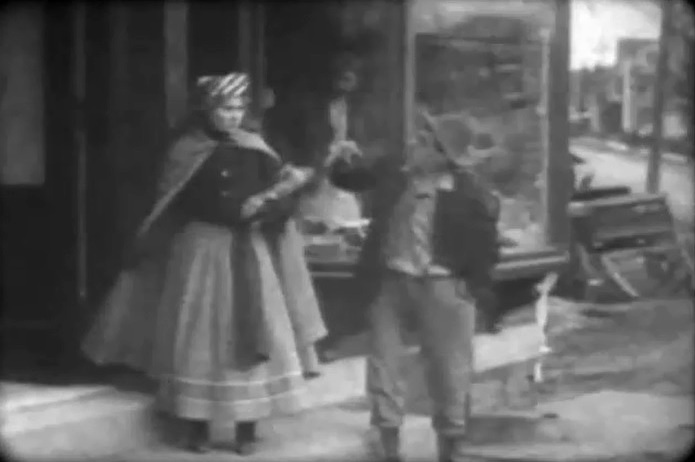 Charles Inslee shows to George Gebhardt that he has no money as Marion Leonard looks on in "The Cord of Life" (1909), directed by D. W. Griffith. 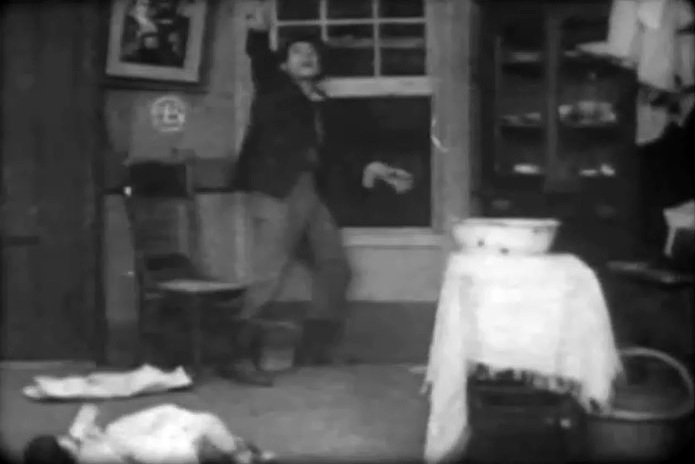 George Gebhardt vows revenge in "The Cord of Life" (1909), directed by D. W. Griffith. George Gebhardt waits for his opportunity as Marion Leonard chats with a neighbor in "The Cord of Life" (1909), directed by D. W. Griffith. George Gebhardt grabs the child in "The Cord of Life" (1909), directed by D. W. Griffith. George Gebhardt invents his diabolical plan in "The Cord of Life" (1909), directed by D. W. Griffith. 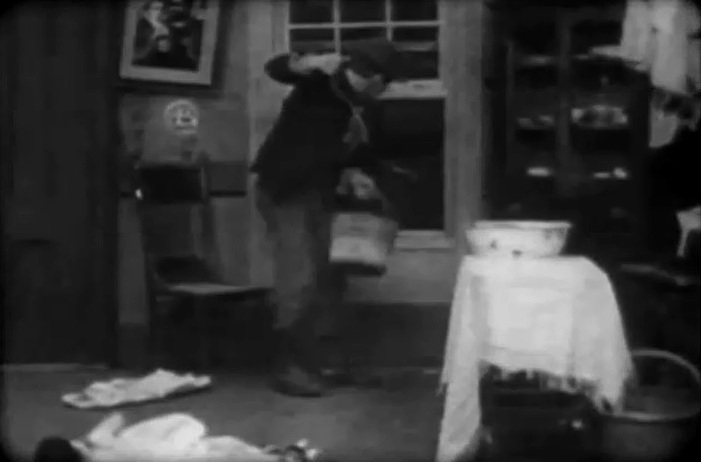 George Gebhardt tests his gruesome plan with a bucket in "The Cord of Life" (1909), directed by D. W. Griffith. George Gebhardt puts the child in a basket in "The Cord of Life" (1909), directed by D. W. Griffith. 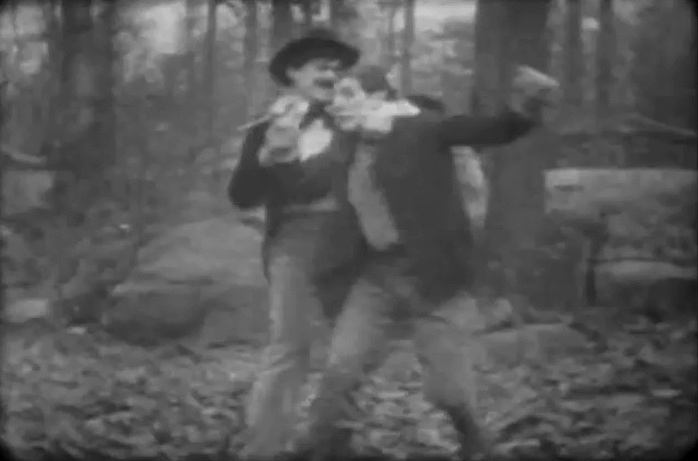 George Gebhardt follows Charles Inslee holding a knife in "The Cord of Life" (1909), directed by D. W. Griffith. 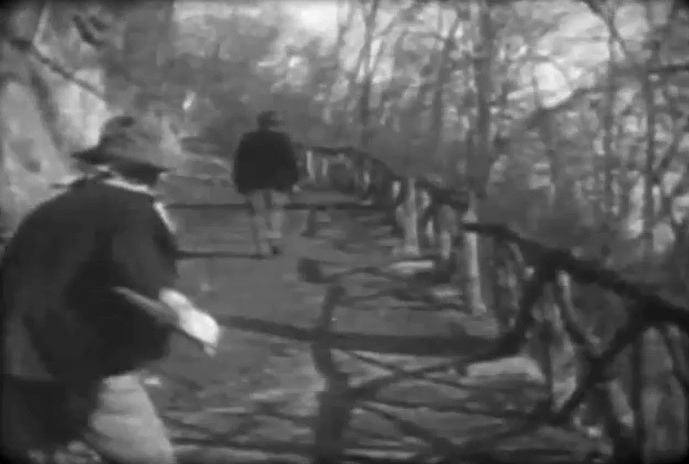 Charles Inslee manages to avoid George Gebhardt's blade in "The Cord of Life" (1909), directed by D. W. Griffith. 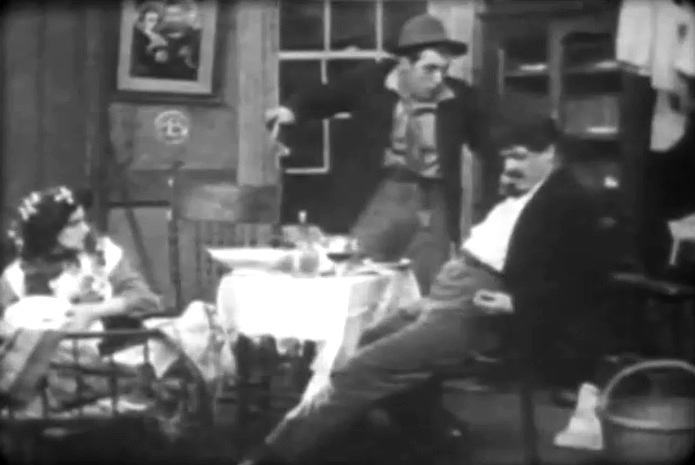 George Gebhardt tells Charles Inslee what he did to his tittle girl in "The Cord of Life" (1909), directed by D. W. Griffith. Arthur V. Johnson is the cop closing the door as Charles Inslee hugs Marion Leonard in "The Cord of Life" (1909), directed by D. W. Griffith.